Introduction to HIV infection and Neuro-AIDS. Neuroepidemiology of HIV/AIDS. HIV neurology in the developing world. The neuropathogenesis of HIV-1 infection. Neurological sequelae of primary HIV infection. AIDS dementia complex. Neurocognitive assessment of eprsons with HIV disease. HIV myelopathy. Peripheral neuropathy of HIV infection. Myopathy in HIV infection. Cerebral toxoplasmosis in AIDS. Cryptococcal infection. Progressive multifocal leukoencephelopathy. Other opportunistic infections of the central nervous system in AIDS. Primary central nervous system lymphoma. Neuroimaging of the HIV/AIDS patient. Cerebrospinal fluid markers in central nervous system HIV infection and AIDS dementia complex. The neuropathology of HIV. Neuropharmavology of HIV/AIDS. 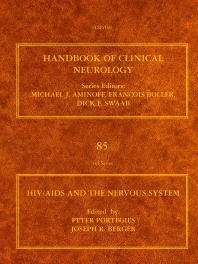 This volume provides a comprehensive understanding of HIV/AIDS and neuro-AIDS, including a history of the disease, and an explanation of many of the conditions that can arise in afflicted patients, including opportunistic infections, central nervous system tumors, spinal cord disorders, myopathies and progressive encephalopathy, amongst others. Clinicians will gain a greater understanding of the complex mechanisms of the disease. Beginning with a basic introduction to HIV infections and Neuro-AIDS, practitioners will find useful data on advances in molecular biology, neuroepidemiology, neuroimaging, neuropathology, neuropharmacology, as well as information on the development of therapeutic strategies appropriate for the disorder, including groundbreaking retroviral therapies. In addition, the socioeconomic and political constraints that hinder treatment and disease management in developing parts of the world are presented. Prof. Portegies has worked as a neurologist at the OLVG Hospital in Amsterdam since 2003, and has been the hospital's Neurology department instructor since 2004. Prior to joining the OLVG, he was a staff member and the Clinical Director of the Neurology department at the AMC. In his capacity as Professor by Special Appointment, and in cooperation with the AMC's Neurology and Infectious Diseases department, Prof. Portegies gives new impetus to research on the neurological complications of HIV infection. Prof. Portegies has a number of different board positions, including Vice-Chairman of the Netherlands Neurological Society (Nederlandse Vereniging voor Neurologie), Secretary of the AIDS Research Amsterdam foundation and Chairman of the European Federation of Neurological Socieities' Task Force Management of HIV-related Neurological Complications. In 2007 he was awarded the ‘Best Neurology clinician' education prize by the UvA's Interns' Council (Co-Raad, the University's association run by and for medical interns).